A team of technical divers and scientists, accompanied by an autonomous underwater vehicle (AUV) and molecular biology tools, will comprehensively map, photograph, and study part of Bermuda’s deepest reef system with funds from the Cawthorn Innovation Award, now in the third year of supporting the work of BIOS scientists. 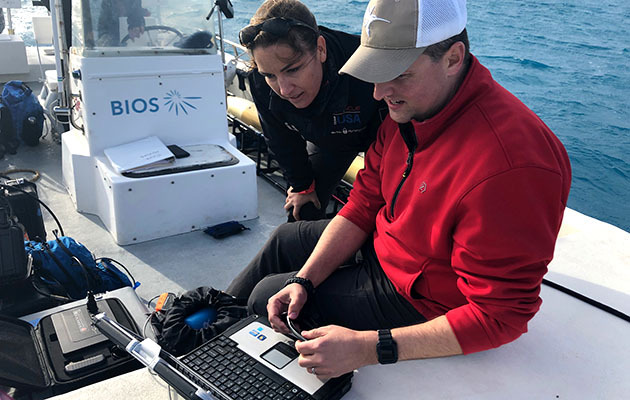 This year’s award recipient, marine ecologist and faculty member Gretchen Goodbody-Gringley, will begin work this month in collaboration with BIOS research specialist and technical diver Alex Chequer and oceanographer Arthur Trembanis of the University of Delaware. 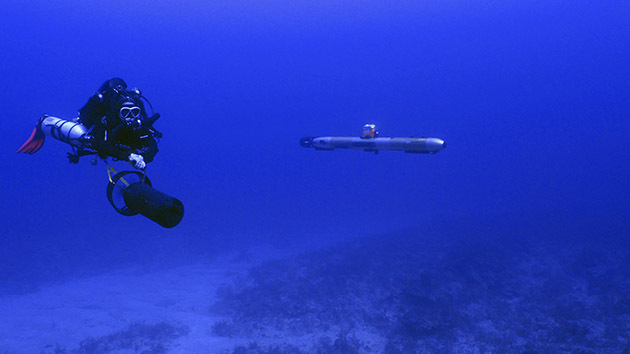 Prior to undertaking the deep reef research project with Goodbody-Gringley, Trembanis and his students who were visiting BIOS for a field course in geology and oceanography used the AUV and a remotely operated vehicle (or ROV) to conduct a seafloor mapping expedition in Castle Harbor, Bermuda. 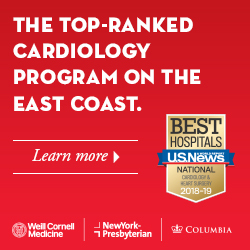 Their study area is directly adjacent to a renowned, extensive reef called Hog Breaker, located off Bermuda’s north shore. This shallow reef, extending no more than 35 feet (10 meters) in depth, is prized by divers for its complex array of coral formations and diversity of species, including algae, sponges, corals, and fishes, including large species like black grouper and barracuda and schools of smaller, more ornate species, such as the black durgeon. Hog Breaker reef also has a long history as a site for ocean acidification research conducted by BIOS adjunct scientist and marine biologist Andreas Andersson. But until now, scientists have not examined the nearby deeper reef regions. Goodbody-Gringley and her team will be studying an area known as a mesophotic (from “meso” meaning middle and “photic” meaning light) coral ecosystem (MCE), an area that typically extends from 100 to almost 500 feet (30 to 150 meters) depth. In light of the large-scale degradation on shallow reef systems, MCEs have been proposed as potential refuges for coral species, Goodbody-Gringley said. These deeper systems appear to be buffered from many of the local and global environmental changes affecting shallow-water coral reefs, including storm damage, thermal (temperature) stress, sediment stress, and habitat fragmentation, among others. “If MCEs are, in fact, an important ‘life boat’ for coral survival, it is critical to understand the various processes regulating community composition and ecosystem function,” she said. “The idea is to gather data from the deeper region which, at present, remains unexplored We are interested in finding connections between these deep reefs and the shallow reefs, in terms of species overlap and genetic exchange,” which represent one way that scientists determine species range distributions and potential rates of evolution. This month BIOS marine ecologist Gretchen Goodbody-Gringley began her collaboration with oceanographer Arthur Trembanis of the University of Delaware to comprehensively map, photograph, and study part of Bermudaâ€™s deepest reef system, with support from the Instituteâ€™s Cawthorn Innovation Fund. The scientists, assisted by BIOS research specialist and technical diver Alex Chequer, will be using the Teledyne “Gavia” autonomous underwater vehicle (or AUV), which Trembanis and his team affectionately call â€œDora.â€ Photo by Alex Chequer. This month, the team will deploy an AUV to move above the reef in a “mowing the lawn” pattern. The AUV will carry a combination of sonars used to make wide-area, high-resolution maps of the bottom and advanced camera systems used to capture detailed, overlapping images. The fusion of the imagery will provide a comprehensive look at this small piece of the larger reef system, which covers an area about 2.3 square miles (6 square kilometers) and reaching depths just beyond 200 feet (60 meters). Satellite images have been used to monitor nearby shallow sites, but MCEs lie beyond the depths which satellite and air-born imagery can penetrate. “We are missing chunks—whole zones, really—of data at 30 to 60 meters depth,” Goodbody-Gringley said. By combining the AUV with technical diving, the team will be able to map and monitor these reefs for the first time. Both Goodbody-Gringley and Chequer are experienced technical divers, trained in the use of breathing mixed gases, such as trimix, which incorporates helium to circumvent nitrogen narcosis and oxygen toxicity, and in decompression procedures used during ascent to avoid decompression sickness for dives beyond 100 feet (30 meters). The Cawthorn Innovation Award also supported the placement of small tiers of tiles at the site called autonomous reef monitoring structures, or ARMS, that reef organisms settle on and colonize. Each unit, which Goodbody-Gringley said resembles a tiny apartment building, is a stack of 10 spaced plates that will be left on the ocean floor for a year. Marine invertebrates, such as corals, sea stars, sea cucumbers, sponges, snails, and worms, take up residence in the ARMS, much like they would on the natural seafloor. The Cawthorn Innovation Award was established in 2016 by BIOS trustee emeritus Rob Cawthorn to support innovative and challenging research ideas. 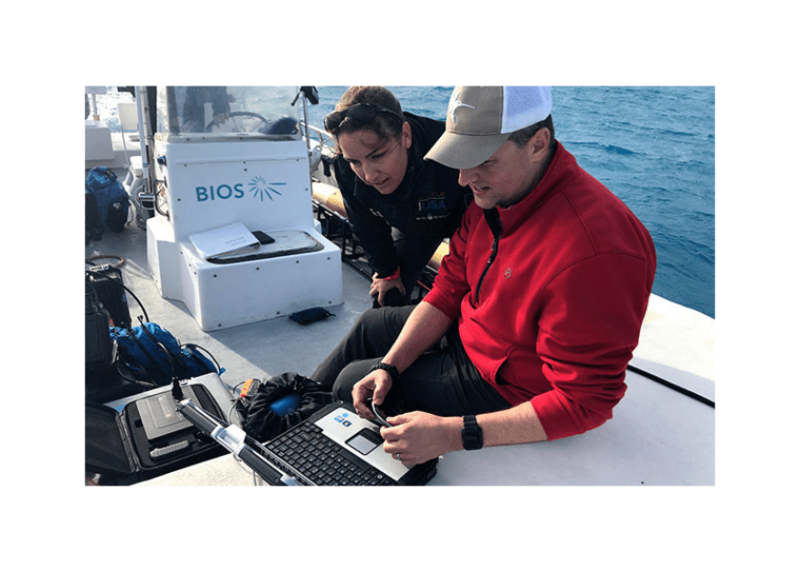 Award recipients in 2017 included BIOS reef ecologists Eric Hochberg and Yvonne Sawall, as well as chemical oceanographer Nick Bates, to support their multidisciplinary project that tests a new method of measuring fundamental reef ecosystem processes. Funding supported the acquisition of two new automated water samplers called remote access samplers.